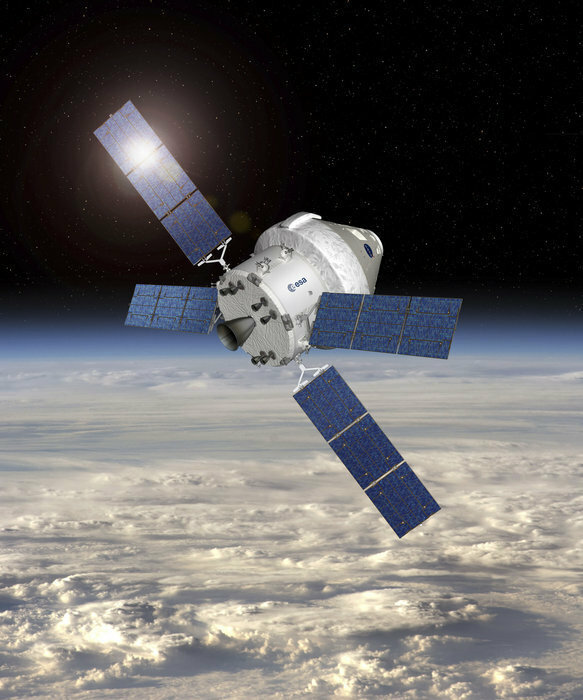 NASA’s Orion spacecraft aims to send humans further into space than ever before, and ESA’s European Service Module will provide the essentials for keeping the astronauts alive and on course. A review of the programme by NASA to assess progress is now showing a launch date from December 2019 to June 2020. 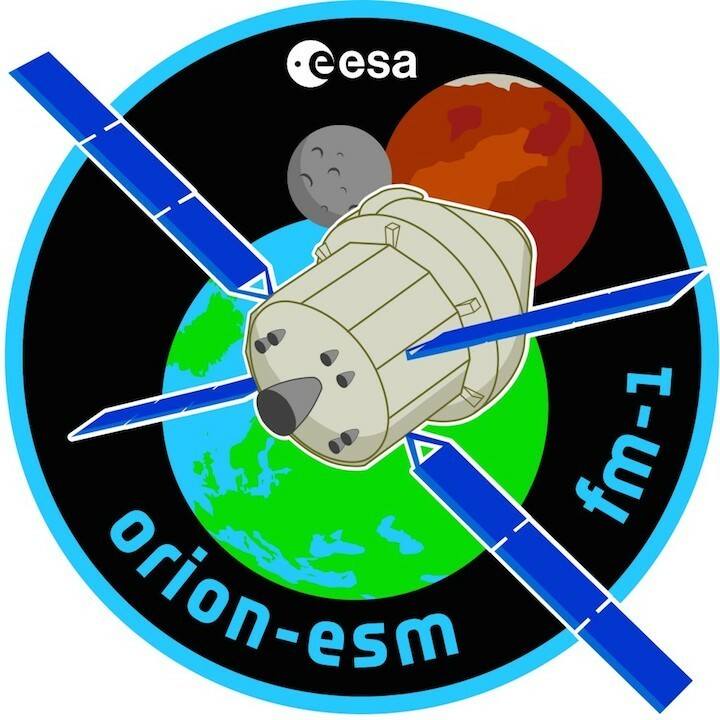 The first Exploration Mission-1 will circle the Moon without astronauts to lay the foundation and prove the technology for a second mission with a crew. In Bremen, Germany, integration of the service module is well under way, with work already starting on the second. More than 11 km of cables are being laid and connected to send the megabytes of information from the solar panels, fuel systems, engines, and air and water supplies to the module’s central computers. Recently, the Orion’s 24 orientation thrusters were installed, complementing the eight larger engines that will back up the main engine. The module’s complex design requires 1100 welds for the propulsion system alone, with only 173 left to complete. Set to be shipped to the USA in the first half of 2018, ESA’s contribution to NASA’s Orion spacecraft is taking shape at Airbus in Bremen, Germany. This is no test article: the service module pictured here will fly into space, past the Moon and farther than any other human-rated spacecraft has ever flown before. The service module will supply electricity, water, oxygen and nitrogen, propulsion and temperature control. The blue circular frame is the support structure that holds the module as technicians work to get it ready. Yellow ties (removed before flight) keep the 11 km of wiring in place as the thousands of components are installed and connected. Behind the red support covers are the eight 490 N R-4D-11 thrusters, built by Aerojet. 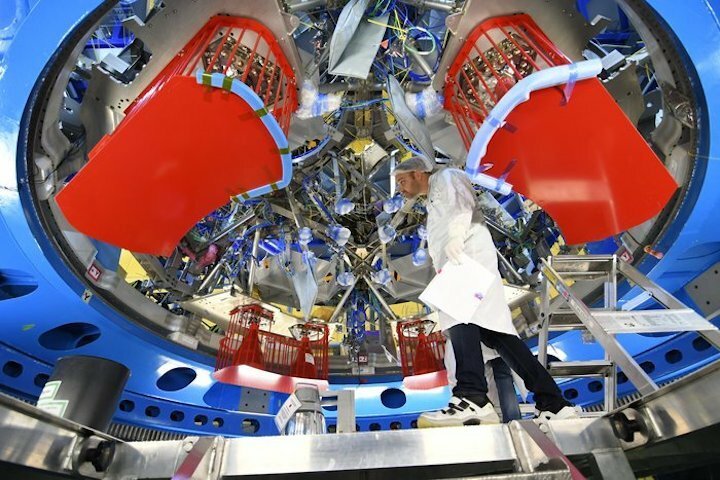 Technicians are working in three shifts a day to assemble the components that are being shipped from all over Europe to complete this service module. Teams in Bremen at the Airbus integration room are on eight-hour shifts to keep work running 24 hours a day, aiming for a shipment of the completed module to the USA in the summer of 2018. It will be flown to NASA’s Kennedy Space Center in Florida, where it will be combined with the crew module before they are moved to NASA’s Plum Brook station in Ohio for extensive tests to ensure they are ready for launch and the voyage into deep space. The service module is based on technology from ESA’s tried-and-tested Automated Transfer Vehicles that flew to the International Space Station on five missions. For Orion, the design is more complex with more systems but the technology behind it has been miniaturised to fit into the smaller Orion structure. NASA will test Orion’s launch abort system in high-stress ascent conditions during an April 2019 test called Ascent Abort-2. 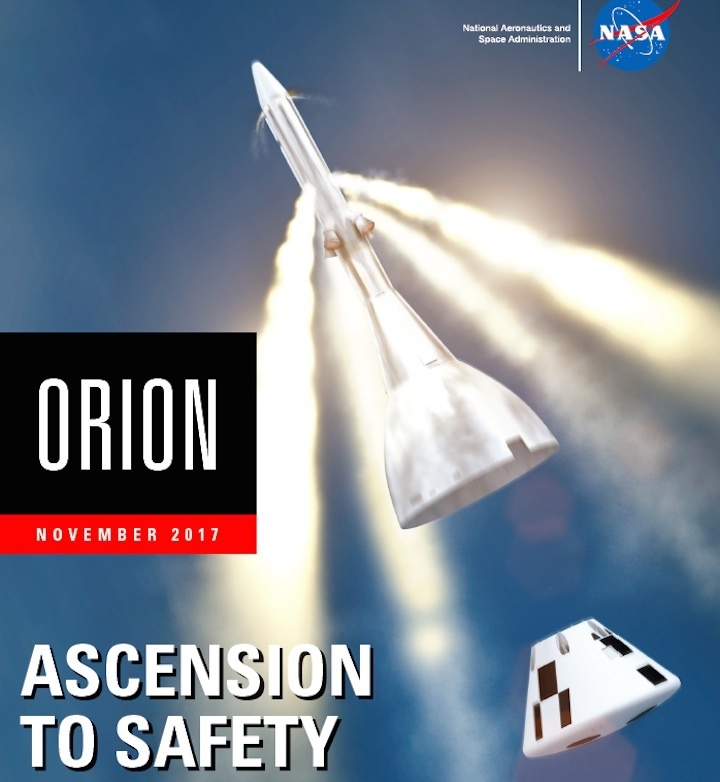 NASA’s Orion spacecraft is scheduled to undergo a design test in April 2019 of the capsule’s launch abort system (LAS), which is a rocket-powered tower on top of the crew module built to very quickly get astronauts safely away from their launch vehicle if there is a problem during ascent. This full-stress test of the LAS, called Ascent Abort Test 2 (AA-2), will see a booster, provided by Orbital ATK, launch from Cape Canaveral Air Force Station in Florida, carrying a fully functional LAS and a 22,000 pound Orion test vehicle to an altitude of 32,000 feet at Mach 1.3 (over 1,000 miles an hour). At that point, the LAS’ powerful reverse-flow abort motor will fire, carrying the Orion test vehicle away from the missile. Timing is crucial as the abort events must match the abort timing requirements of the Orion spacecraft to the millisecond in order for the flight test data to be valid. NASA is accelerating the timeline of the test to provide engineers with critical abort test data sooner to help validate computer models of the spacecraft’s LAS performance and system functions. The test will verify the LAS can steer the crew module and astronauts inside to safety in the event of an issue with a Space Launch Systemrocket when the spacecraft is under the highest aerodynamic loads it will experience during a rapid climb into or beyond orbit for deep-space missions. 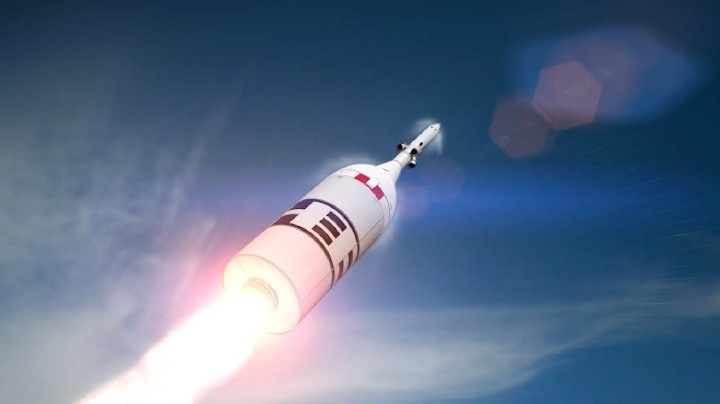 In a test targeted for April 2019 known as Ascent Abort-2, NASA will verify the Orion spacecraft’s launch abort system. The test will last less than three minutes with the test crew module reaching an average speed of Mach 1.5, roughly 1020 miles per hour, at approximately 32,000 feet in altitude. The LAS is divided into two parts: the fairing assembly, which is a shell composed of a lightweight composite material that protects the capsule from the heat, wind and acoustics of the launch, ascent, and abort environments; and the launch abort tower, which includes the system’s three motors. In an emergency, those three motors – the launch abort, attitude control, and jettison motors – would work together to pull Orion away from a problem on the launch pad or during SLS first stage ascent, steering and re-orienting for LAS jettison, and pulling the LAS away from the crew module. During a normal launch, only the LAS jettison motor would fire, once Orion and the Space Launch System clear most of the atmosphere, to clear the LAS from Orion and allow the spacecraft to continue with its mission. Engineers at several NASA centers already are building the Orion test article that has many of the design features and the same mass as the capsule that will carry crew. 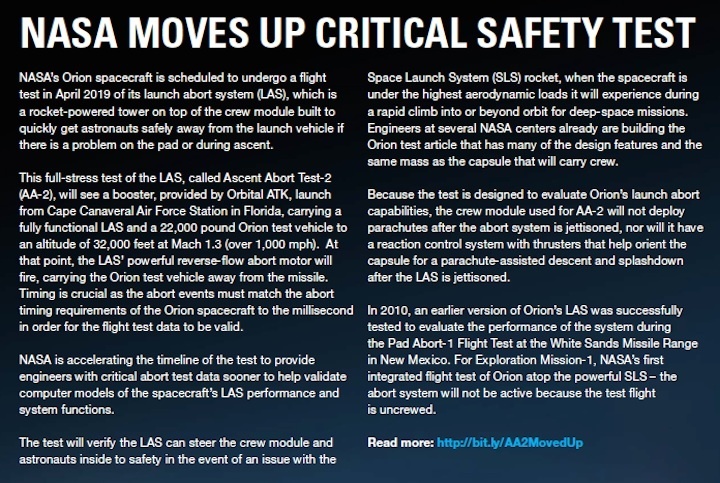 Because the test is designed to evaluate Orion’s launch abort capabilities, the crew module used for AA-2 will not deploy parachutes after the abort system is jettisoned, nor will it have a reaction control system with thrusters needed to help orient the capsule for a parachute-assisted descent and splashdown after the LAS is jettisoned. The AA-2 test development and execution is a partnership between Orion Program and the Advanced Exploration Systems Division, the technology advancement organization in the Human Exploration and Operations Mission Directorate at NASA Headquarters in Washington. NASA Johnson is responsible for producing the fully assembled and integrated crew module and separation ring, including development of unique avionics, power, software and data collection subsystems and several elements of ground support equipment. The agency’s Langley Research Center in Hampton, Virginia, will build the primary structure of the crew module test article and a separation ring that connects the test capsule to the booster and provides space and volume for separation mechanisms and instrumentation. Critical sensors and instruments used to gather data during the test will be provided by NASA’s Armstrong Flight Research Center in Edwards, California. The integrated test article will be delivered to NASA’s Kennedy Space Center in Florida, where it will be processed before launch. 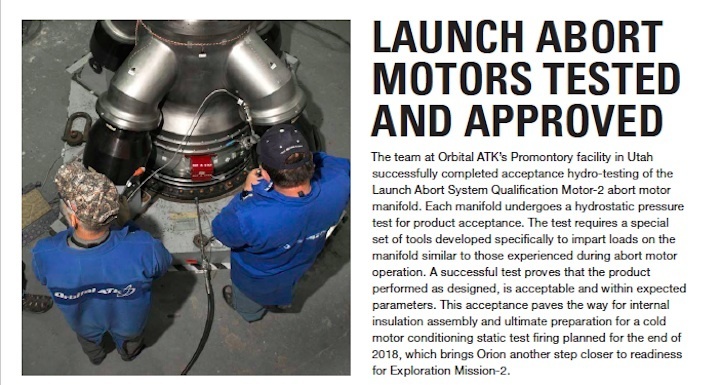 NASA’s prime contractor, Lockheed Martin, is providing the fully functional Orion LAS, and the crew module to service module umbilical and flight design retention and release mechanisms. In 2010, an earlier version of Orion’s LAS was tested to evaluate the performance of the system in during Abort Test Booster-1 at the White Sands Missile Range in New Mexico. For Exploration Mission-1, NASA’s first integrated flight test of Orion atop the powerful SLS -- the abort system will not be fully active since astronauts will not be inside the spacecraft. NASA is working toward a December 2019 launchfor EM-1. NASA's upcoming Europa Clipper mission will send a spacecraft to explore Jupiter's icy moon Europa. Over the course of 45 flybys, ranging from 2,700 to just 25 kilometers, the mission will explore whether or not the moon is habitable, and pave the way for a potential future lander that will directly search for the life. The spacecraft itself is on track to launch as early as 2022, providing the White House and Congress continue funding the mission at its required pace. But whether or not Clipper actually launches in 2022, and what rocket it uses, is another matter. NASA recently announced the first flight of the Space Launch System, which is the current rocket of choice, won't happen until at least December 2019, and more likely, closer to June 2020. This further complicates what was already a messy tangle of politics, programmatic challenges and orbital mechanics. NASA has debated the priority of Clipper with Congress since before the mission's inception. With an estimated price tag between $3 and $4 billion, according to a GAO analysis, the agency worries how Clipper will impact other planetary science programs. A line in NASA's 2018 budget request states the agency's current position as such: "NASA does not recommend acceleration of the launch to 2022, given potential impacts to the rest of the Science portfolio." Congress—particularly, Texas House Representative John Culberson—has tried to alleviate those concerns by feeding more money to planetary science, earmarking $275 million directly to the Clipper mission for 2017 alone. That money came with a mandate, written into law, that NASA will launch the mission in 2022 using the Space Launch System. Just how much wiggle room NASA has on that mandate is tricky to decipher. Policy experts told me the only enforcement mechanism is pulling the project's funding, and if SLS isn't ready to fly, the directive could be a moot point, anyway. Furthermore, the requirement did not come with any additional money to make it happen; who would pay for an extra SLS flight remains unclear. NASA, perhaps skeptical that it can afford to fly Clipper on SLS without additional funding, also addressed the situation in the 2018 budget: "The Europa [funding estimates] above assumes an Evolved Expendable Launch Vehicle [specifically, a Delta IV Heavy or Falcon Heavy], as the cost of an SLS flight is not yet known." NASA's official Clipper mission materials have also not adjusted to Congress's mandate, merely estimating a launch in the 2020s. Any other rocket besides SLS—including SpaceX's upcoming Falcon Heavy—lacks the power to blast Clipper directly from Earth to Jupiter. A conventional rocket would rely on three gravity assists from Earth and one from Venus, increasing the transit time from about 2.7 years to 7.5 years. Because it's hotter at Venus, Clipper would have to carry thermal baffles and use materials that withstand higher temperatures, increasing the spacecraft's complexity. At the moment, the Clipper program is still designing the spacecraft with those Venus requirements in mind. A Clipper launch aboard SLS in 2022 is even more uncertain in the wake of NASA's announcement that the first flight, Exploration Mission 1 (EM-1), won't launch until at least December 2019, and as late as June 2020. After that, there will be a 33-month pause while the rocket's ground systems are upgraded to handle a new upper stage. Direct-to-Jupiter launch windows have tight, 3-week constraints, and occur about every 13 months. The first launch window runs from June 4 through June 24, 2022. Even if SLS embarks on its first mission in December 2019, it won't be ready again by the end of the first window on June 24, 2022, and the next Clipper launch opportunity isn't until July 2023. That means NASA can't currently meet Congress's requirement that Clipper launch on SLS in 2022. This runs counter to recent statements made by William Gerstenmaier, NASA's associate administrator for human spaceflight exploration and operations, during a recent hearing held by the House space subcommittee. When asked if the SLS launch delay would impact Clipper timing, Gerstenmaier said, "There's really no impact there. We can support pretty much whatever the science mission directorate needs for that mission, and we'll figure out whether it occurs after the first flight or after the second flight to meet their needs." At the heart of this messy situation is the 33-month stand-down after EM-1. Here's the background: SLS was such an expensive, ambitious rocket, it couldn't be built all at once. NASA opted to make the vehicle design evolvable, getting more powerful over time with an advanced upper stage, and eventually—so the plan goes—liquid-fueled boosters. 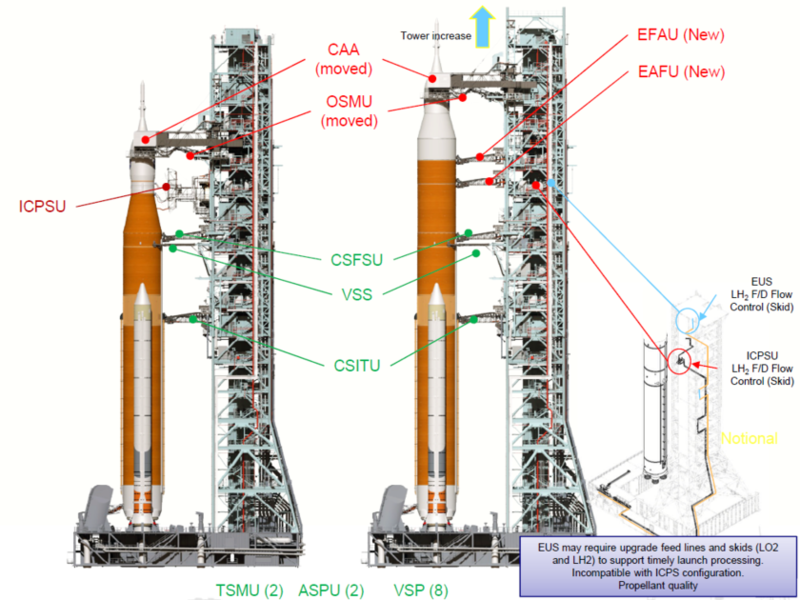 For EM-1, NASA is using an off-the-shelf Delta IV upper stage. The new upper stage, which will be introduced for the crewed, second flight (EM-2), will make the vehicle 13 meters taller. 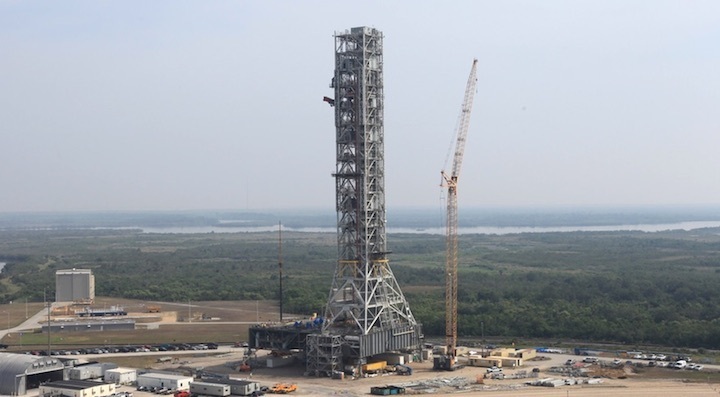 A 13-meter height change triggers a staggering amount of modifications to the mobile launcher, or ML—the tower holding all the rocket's support equipment, such as propellant, power, and access for pad workers. 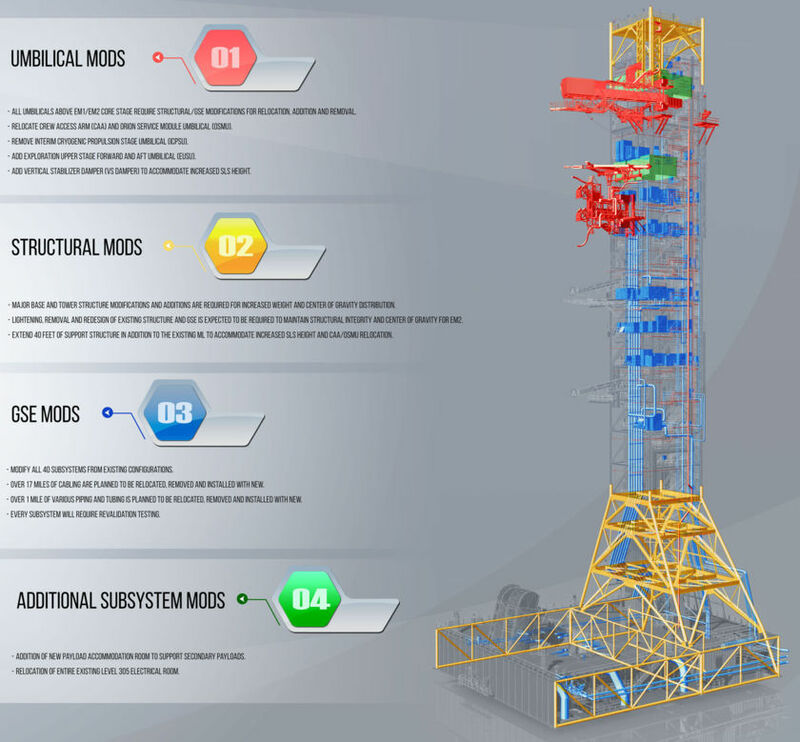 The items shown in red on this Ground Systems Development Office rendering show which major pieces of the mobile launcher must be removed, altered or added. The propellant feeds for the interim upper stage get removed, and feeds for the new upper stage are installed farther up the tower. The liquid oxygen and liquid hydrogen feed lines must be re-routed to their new locations, and NASA says more than a mile of pipes and tubes will be moved in total. A key electrical room must be relocated, along with 17 miles of cabling, and NASA is also building a new support room for secondary payloads that will ride along beneath Orion. Making all this even more difficult is the fact the ML was originally built for a completely different rocket, Ares I, which was part of the return-to-the-Moon Constellation program. After the Obama administration cancelled Constellation and Congress directed NASA to build SLS, the agency modified the Ares I mobile launcher rather than start from scratch for SLS, because Congress directed NASA to use and modify existing Constellation hardware where possible. As a result, the ML is very crowded, and running up against weight limits, making the upgrade more difficult and less efficient. Note: In order to maximize the amount of mass that can be delivered to Jupiter, the team only plans for two arrival dates. If Clipper launches early in the window, it will arrive on the first date. If it launches later in the window, it will arrive on the second date. With 2022 off the table, the next possibility is July 2023. But there's another problem: 2023 is also the estimated launch year for EM-2, the first crewed SLS mission. At the House space subcommittee meeting, Gerstenmaier was asked whether the recent SLS delay would impact EM-2. Once again, he said there would be no impact. If that's true, for both Clipper and EM-2 to launch in 2023, EM-2 would likely need to launch in either January or December to give ground crews enough breathing room to support a July Clipper launch. In theory, this is possible: NASA told me the ground systems architecture is designed to support a flight rate of every 120 days. But in reality, this seems unlikely. Just because NASA can launch SLS every four months doesn't mean they can build the actual rockets at that rate. 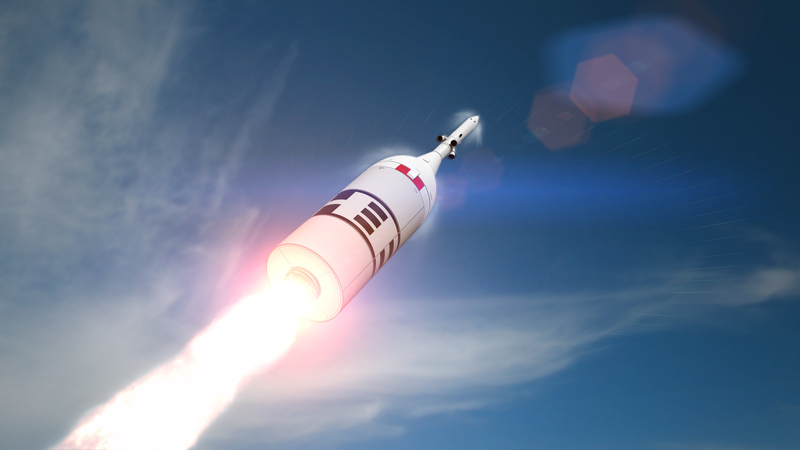 In the past, NASA officials have indicated SLS won't fly more than once per year at first, with twice-per-year flights coming later in the 2020s. Rapidly launching two vehicles after a 33-month pause could be a tall order. That could put NASA in the tough position of having to slip either Clipper or EM-2 to 2024. One potential solution is a second mobile launcher. At an October 5 meeting of NASA's Aerospace Safety Advisory Panel (ASAP), which advises NASA on safety and performance issues, panel members raised the notion the agency could build a second mobile launcher. A second ML, if started now, could in theory, be ready to support a 2022 Clipper launch—providing the new upper stage was ready in time (the Delta IV interim stage lacks the power for a direct-to-Jupiter trajectory). Interestingly, the recommendation was made primarily for safety reasons. In an email, ASAP member Donald McErlean told me the group was concerned the SLS ground crew could get rusty during the 33-month delay between the first and second flights. "For safety reasons, ASAP believes it is appropriate to minimize that gap to reduce the need for relearning operational skills by the workforce," McEarlean wrote. "The proposal to build a second (ML) mitigates that risk as construction can begin prior to the EM-1 launch. NASA may have additional technical reasons to build and potential uses for the second MLP that adds to its value and makes that investment more attractive, however those are not ASAP's main reason for supporting this approach." Gerstenmaier also brought up a second ML during his Congressional hearing. "We need to potentially discuss whether it's advantageous to us to have another mobile launcher available to avoid that tie between EM-1 and EM-2," he said. How much a second ML would cost—and whether the White House and Congress would be willing to fund it—is hard to say. NASA officials told me the agency spent $330 million on the ML for Ares I, and $400 million to upgrade the ML for the first version of SLS with the Delta IV interim upper stage. In Oct. 2016, NASA released a contract solicitation for a design work to get the ML ready for the second iteration of SLS, with the new upper stage. Ten months later, in August 2017, the agency awarded the contract to Florida-based architecture and engineering consulting firm RS&H. The contract was worth $30 million; actual demolition, construction and installation will be handled under a separate, yet-to-be awarded contract. The alternative to all this uncertainty is launching Clipper aboard another vehicle. But the longer transit time means Clipper wouldn't get to Jupiter until January 2030 at the earliest. Even if SLS can't launch Clipper until 2024, it will still arrive three years earlier, in 2027. A shorter journey lowers operational costs because the Clipper team doesn't have to sit around waiting as long while the spacecraft makes its way out to Jupiter. It also means NASA will return to the outer solar system a lot faster, and Europa scientists that have been waiting since the Galileo mission for another up-close look at Jupiter's enigmatic moon will get their data back much quicker. "It would be much better if we get to go on the Space Launch System," said Robert Pappalardo, the Europa Clipper project scientist, during a recent presentation at the Lunar and Planetary Institute in Houston. "And then I won't be retired yet, and can see this mission to fruition," he joked. The ability to launch a flagship science mission like Clipper has long been hailed as a major benefit of building SLS. In the past, Congress has consistently supported the rocket, but House representatives were uncharacteristically critical of the most recent SLS delay during Gerstenmaier's appearance. If NASA uncouples Clipper from SLS, support for the rocket could erode even further. How to resolve this complex situation is just one of many issues the next NASA administrator—Oklahoma Congressional representative Jim Bridenstine, should he be confirmed—will have to deal with. WASHINGTON — Building a new mobile launch platform for later Space Launch System missions could cost NASA $300 million but allow for more frequent launches, agency officials said. Bill Hill, NASA deputy associate administrator for exploration systems development, discussed the tradeoffs regarding building a new mobile launcher during a Nov. 29 meeting of the human exploration and operations committee of the NASA Advisory Council at the Kennedy Space Center. The current mobile launcher, originally built during the Constellation program for the since-cancelled Ares 1, is finishing modifications to support the first SLS launch, which will use the Interim Cryogenic Propulsion Stage (ICPS). Future SLS missions, though, will involve the Block 1B version of the rocket with the larger Exploration Upper Stage, which will require further modifications to the launcher. 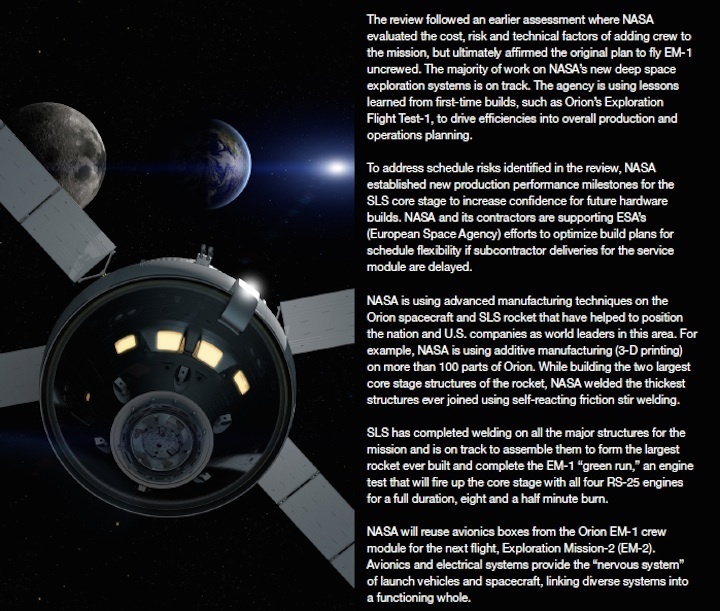 Those modifications mean there is what Hill called an “iron bar” in the schedule between Exploration Missions (EM) 1 and 2. Those modifications to the launcher can’t begin until after the EM-1 launch, which means EM-2 can’t take place until at least 33 months after EM-1, he said. NASA has considered using the SLS for the Europa Clipper mission to Jupiter, with some notional schedules for future SLS launches placing that launch between EM-1 and EM-2, depending on the schedule for that mission and the availability of the SLS. Building a second mobile launcher, Hill said, would involve a net cost to NASA of about $300 million. That includes the cost of the launcher, less the savings from not modifying the current launcher to accommodate the SLS Block 1B. Hill didn’t say if NASA has formally requested a new mobile launcher in its next budget request. “I think that was a rumor,” he said when asked by the committee about it. However, he suggested that a decision on whether or not to build a new launcher would come in the near future. 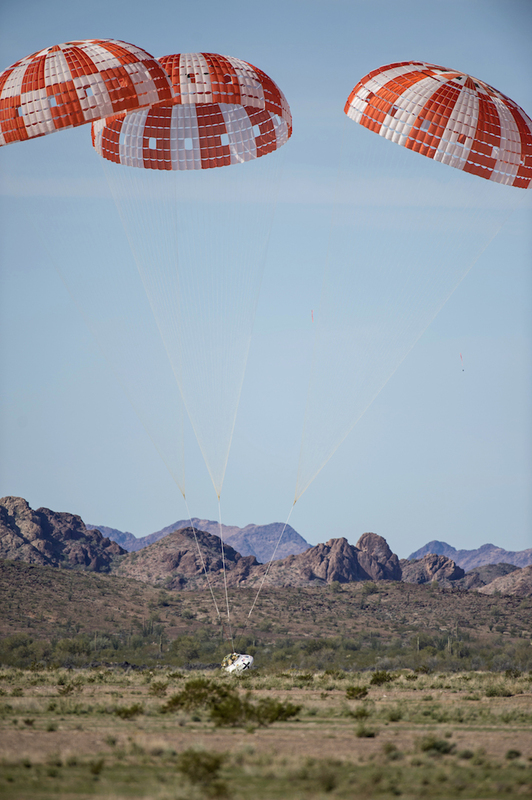 NASA is inviting media to attend a test of parachutes for the agency’s Orion spacecraft Wednesday, Dec. 13, at the U.S. Army’s Yuma Proving Ground in Arizona. 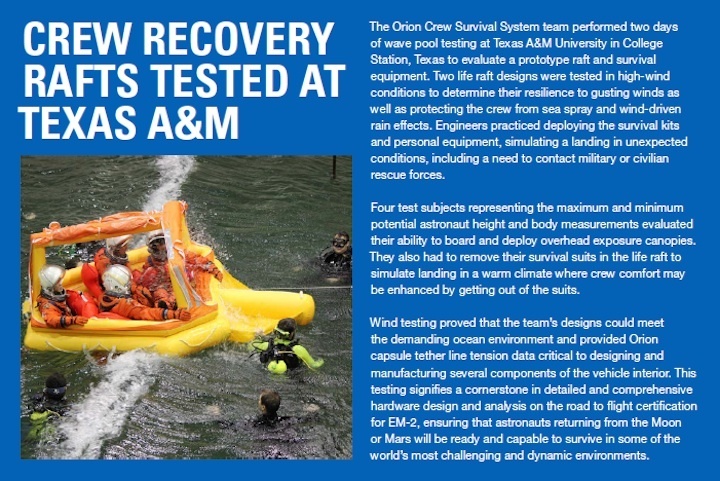 This test is the fifth in a series of eight to qualify the parachute system for crewed Orion missions. Media will have the opportunity to view the test from the drop zone, see the engineering model of Orion up close, and interview NASA personnel including astronaut Butch Wilmore and Exploration Mission-1 manager Michael Sarafin. To attend, media must contact Laura Rochon at laura.a.rochon@nasa.gov by 1 p.m. EST Friday, Dec. 8. During the test, a model Orion spacecraft will be dropped from a C-17 aircraft flying at an altitude of 35,000 feet. 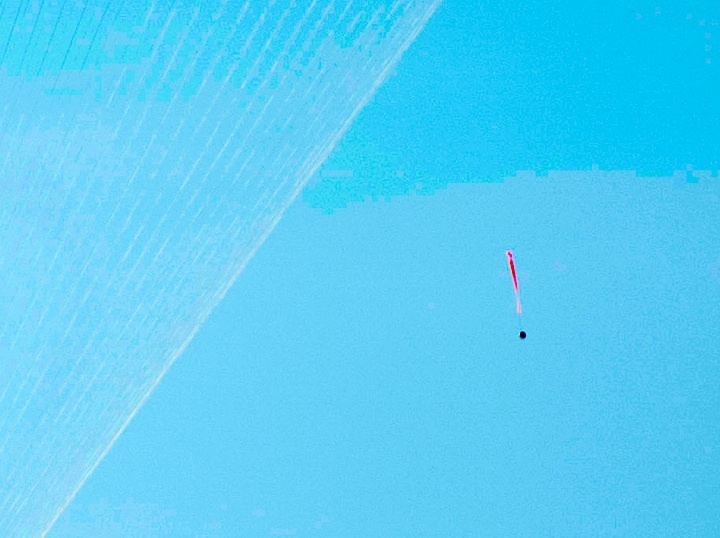 Engineers will evaluate a simulated scenario in which one of the three main parachutes fails to open after the deployment of several other parachutes that help slow and stabilize the spacecraft. 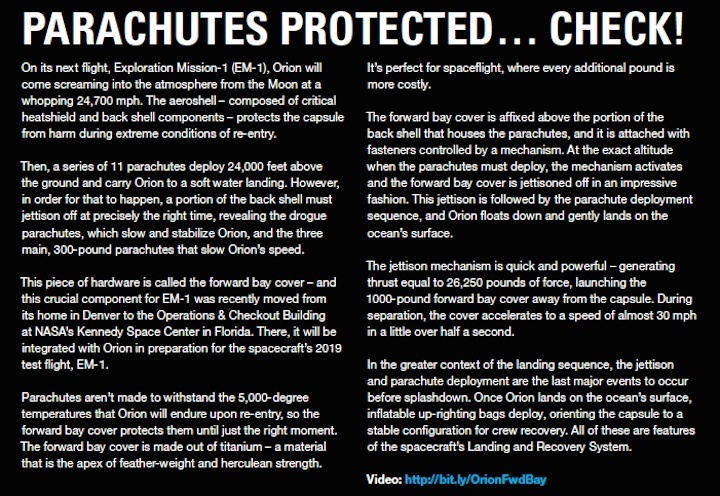 Orion’s parachutes are critical to the safe return of the spacecraft and its future crews after deep-space exploration missions. They help Orion slow from about 300 to 20 mph in less than 10 minutes, enabling a safe splashdown in the ocean. Orion will carry astronauts farther into the solar system than ever before, provide emergency abort capabilities, sustain the crew during their mission and provide safe re-entry through Earth’s atmosphere. PERKINS TWP. — NASA officials working on revolutionary spacecraft at the Plum Brook Station in Erie County didn’t just make a new year’s resolution for next year. • In 2018, they want to perform a minor test at Plum Brook. • In 2019, they want to perform major tests at Plum Brook. • In 2021, they want to launch the vehicle, with crew aboard, from Florida. NASA officials only scheduled one Orion-related test at Plum Brook next year: Come summertime, workers anticipate receiving what’s called the Ascent Abort 2 vehicle. After experiments end at Plum Brook, the equipment will get sent to Kennedy Space Center in Florida for additional testing. 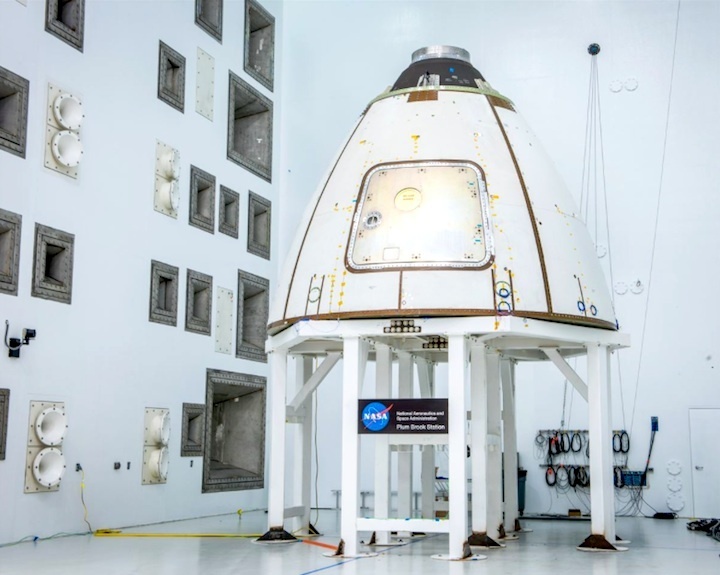 The actual Orion spacecraft heading into space — consisting of a capsule, service module and adapters — will arrive at Plum Brook in early 2019 to undergo space simulated- and electromagnetic-related experiments. In the past, workers tested on Orion’s flight article, which featured a similar design of the actual vehicle destined for a deep-space exploration. 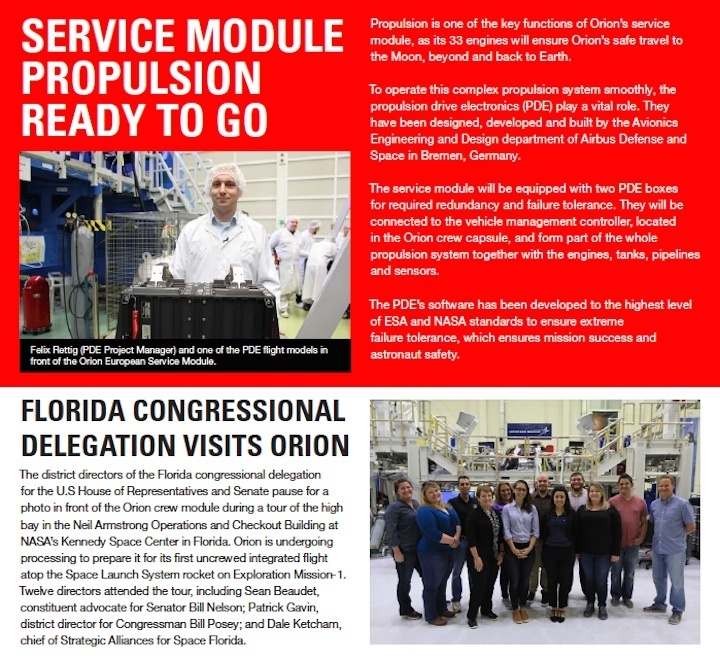 “We have to perform a number of facility tests to ensure that the ground support hardware meets all of its requirements, that the facility is clean enough and that we can provide the extremely low pressure and widely varying thermal environments,” said Nicole Smith, the NASA project manager overseeing Orion’s testing at Plum Brook. Once this round of testing ends, another related one begins. NASA officials want to launch Orion, without any crew, and send it around the moon in 2019 and then repeat this process, but with crew aboard, in 2021. The launch will take place from Florida. Why test Orion in Erie County? 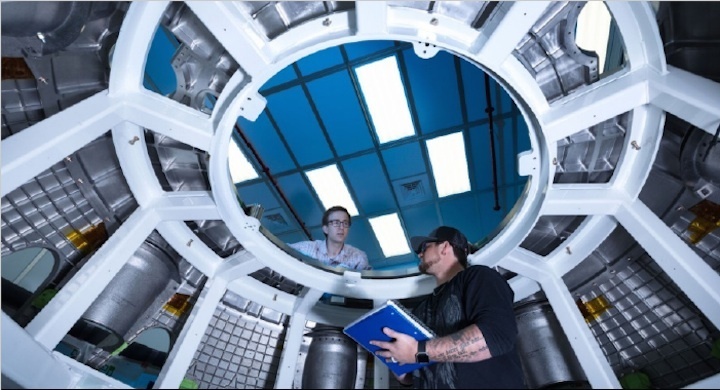 Only at the NASA Plum Brook Station, boasting one-of-a-kind experimental chambers, can engineers and technicians perform specific tests on Orion. Data obtained through testing helps NASA personnel best determine and understand Orion’s effectiveness before a scheduled launch, with crew aboard, to the moon in 2021 and Mars sometime afterward. 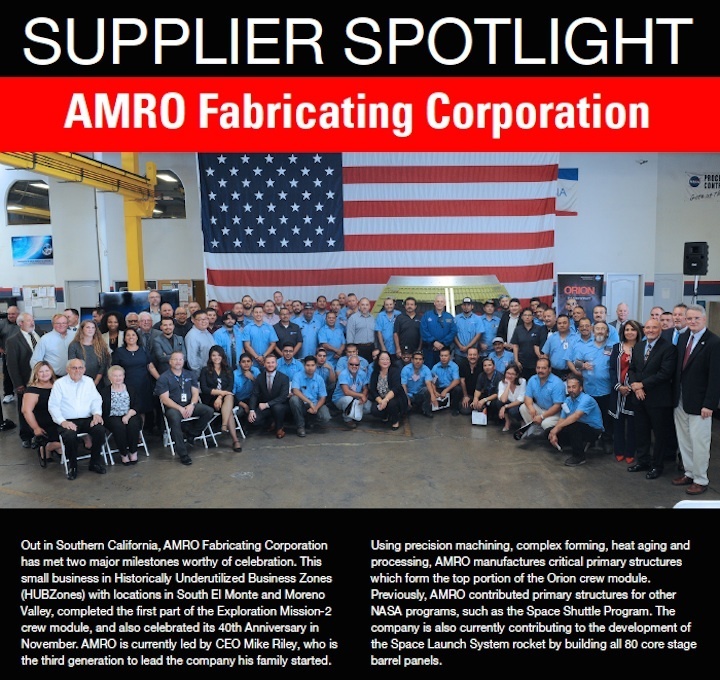 • Staff successfully extended a folded up solar array wing attached to Orion. The testing served as an “important first step to verify Orion’s power system for the spacecraft’s flight … which will venture tens of thousands of miles beyond the moon,” according to a NASA statement. • Then portions of Orion prospered during many other tests, including for sound, vibration, temperature and pyro shocks, ensuring the structure could separate when necessary. Earlier this year, the spacecraft landed at a different NASA station, Kennedy Space Center, located near Orlando, for additional processing.